Here is the book that launched 15,000 ships. In truth, they were tiny ships that fit into bottles, but these ships (or at least their builders) found out how to get them in there from this volume. This how-to book was one of those impossible things that can happen to an author. Fact is, someone asked me to make them a ship-in-a-bottle and I had no idea how it was done. I scouted around looking for information on technique and all I could find was an article written by an old sea captain in a 1933 Popular Mechanics Magazine. 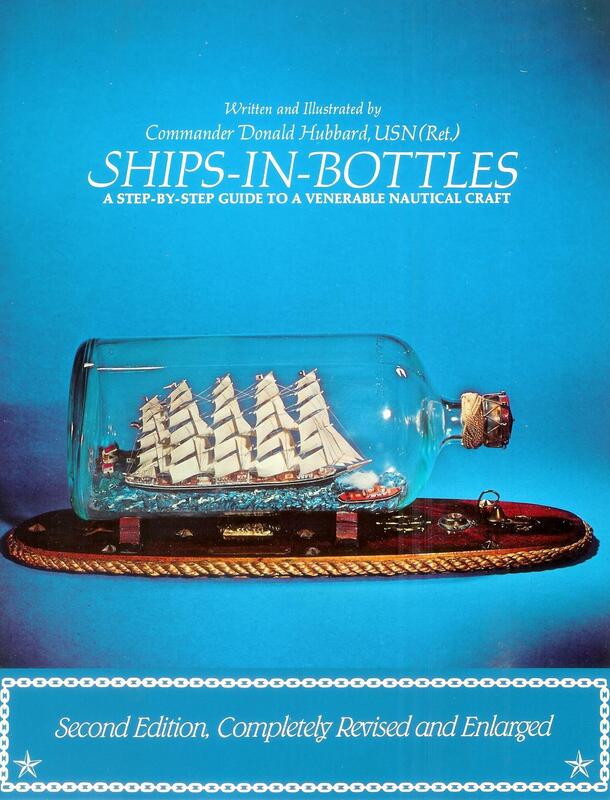 I used this article as my guide and actually produced a bottled ship, but I couldn’t understand why there wasn’t a suitable book or booklet on the subject, so I embarked on the project hoping to get a booklet maker to buy the idea. There was a well-known booklet maker (Walter T. Foster Art Books) in Tustin, a community on the just southeast of Los Angeles, and in 1970 I trekked up there with my offering to show them. I actually met Mr. Foster, and he just chuckled. He said that his first print run was always 10,000 copies and if anything was hard he would receive 10,000 letters complaining, and my work was too hard. But then he said, “I like the idea, but suggest that you take it to a real book publisher”. He suggested that I dig out a copy of Writer’s Market and look for publishers that do “How-To” books. Following his advice I selected McGraw-Hill and timidly offered them my modest manuscript. To my surprise they liked the idea but wanted more content. To this end they assigned me to an editor (an English guy whose uncle made bottled ships) who now coaxed me through the writing and illustration needed to produce a “real” book. To make a long story short, McGraw sold the completed book to David & Charles, Ltd, a well know British publisher and they resold the rights to Verlag Delius Klasing, a German publisher who translated it into that language. Altogether McGraw printed 15,000 copies, David & Charles, 15,000 and the Germans another 20,000. Finally, when the rights were returned to me, I published another 10,000. So we know that there are 60,000 copies of this book are out there, and the best guess is that one out of every four buyers built and bottled one or more models- hence my 15,000 ships guess. If this art-form interests you, get hold of a used (it is now out-of-print) copy of the book through Amazon.com and get busy. The process DOES NOT require patience, since you get too interested to become bored, and only requires minimal tools-most of which you make yourself. 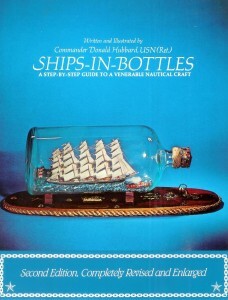 If you want to see some examples of others bottled ship go to www.shipsinbottles.org and www.folkartinbottles.com, and you can also join The Ships-In-Bottles Association of America (an application is on the website), an outfit I co-founded in 1982. Finally, remember, if you do bottle a ship or other object it will probably still be around 500 years from now. What a legacy!